Good did a short piece on revisiting an Eskimo Cookbook that was originally written by students of Shishmaref Day School back in 1951. 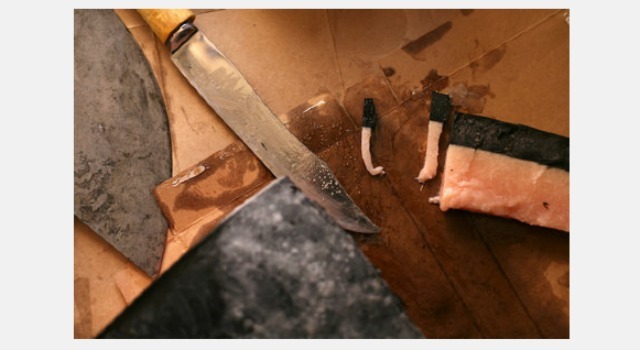 The book features recipes of the Inupiaq village, just 20 miles south of the Arctic Circle, where people enjoy dishes such as Muktuk - raw whale blubbler enjoyed frozen with salt and sometimes seal oil. Today, due to the changing seascape resulting in a leaner yield of fish the Shishmaref rely on other foods to survive, foods very different than what they were used to eating in 1951. I love that a cookbook written by kids for a school project serves today as a testament of how life is changing for the Shishmaref people.